Nowadays, it is becoming more and more likely that you will deal with a chatbot rather than a real person when interacting with your favourite brands. Why is this? 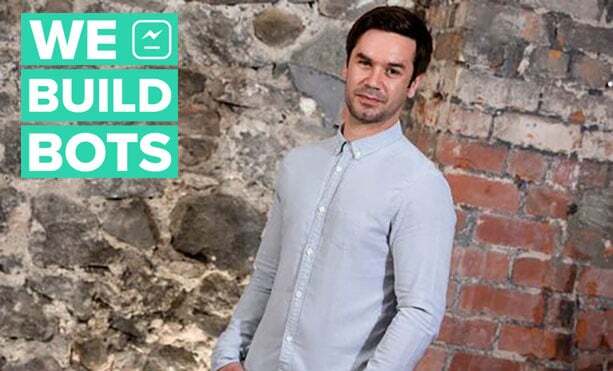 We caught up with Paul Shepherd – a chatbot expert and regular speaker on the subject from Coup Media and its new spinout We Build Bots – to get his take on what’s happening in the world of chatbots. TechSPARK: Would you agree chatbots are disrupting the world of marketing? Paul Shepherd: Not yet, but the potential is definitely there for that to happen. Currently a lot of the chatbots are brand-building bots – used as another marketing channel and doing it well. Media companies, gaming companies and retailers have done good jobs of supplementing campaigns with chatbots, especially Messenger bots, but I think – much like has happened with social media – there’s a real expectation now that chatbots should help us engage, profile and convert more customers. That’s a good thing because it’ll see a lot of the less useful bots drop away and will help to dampen the hype cycle. TS: What’s the most exciting thing about chatbots in your opinion? PS: Basically being able to do things quicker and / or more efficiently than we could do them before. That’s why a bot should be engaged in my opinion. That could be routing calls, filtering leads, booking stuff, changing things (like plane seats) and profiling customers before they need to engage with a human so that when they do actually speak to a human they are closer to where they want to be. TS: Who should be considering getting a chatbot for their business? PS: Anyone who can look at my previous answer and think ‘yes, there’s this thing that we do and it’s repetitive and it’s boring and it’s costing us more time and money than it needs to’. Another consideration is to use a chatbot to engage previously hard-to-reach demographics. I’m not sure it will last forever, but the novelty factor of chatbots means people are willing to give them a go – even it it’s just to try and break them (which they will). TS: Where can people see a good example of a chatbot in action? PS: If you’re into sport, look for the one we built for Sport Wales; its a Facebook Messenger chatbot that helps you decide upon – and then engage with – new sports. If you’re into gaming, try the GamesRadar Facebook bot which will furnish you with all the gaming news you could desire – in little bite-sized chunks. Sephora do a great make-up tutorial-type bot where you can book a session with a specialist. We’re going to see more and more useful chatbots coming to the fore over the next 12-18 months and when in-bot payments launch I feel like the game will completely change again. That, for me, will see chatbots become mainstream. TS: What are the most interesting uses of chatbots that you have seen? PS: Plum is a really neat chatbot that links to your account and makes savings and investment suggestions based on the loose change you’re left with at the end of each month. They’ve just raised on Seedrs and I think it’s a really neat example of how a chatbot can be genuinely useful. 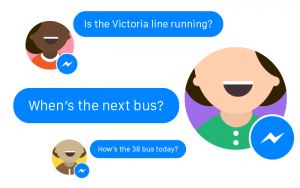 TfL introduced a Messenger bot (see right) to help people discover timetables for the busses and tubes they travel on. Again, useful and easier than accessing other information channels. TS: What would you say to someone who thinks chatbots can be impersonal? PS: Go and play with Replika – a chatbot that basically becomes you after a few weeks of using it. The personality of chatbots are driven by the company and they should feel the opposite of impersonal. If we’re talking about the ethics of using a chatbot to do human stuff then that’s different, and by definition chatbots are impersonal, but we’re probably not getting that deep here, so in terms of a marketing chatbot representing a business and getting stuff done quickly, seamlessly and painlessly then I’d say chatbots have the potential to be pretty personable – and even quite witty. TS: You’ve been talking about chatbots at various events, what’s been the most common question people have asked you? PS: I have and I’ve been enjoying it, so if anyone needs a speaker, just hollah! One of the most common questions is what if my customers don’t use Facebook Messenger, to which the answer is ‘Make them – Your customers never used to use Facebook, Twitter or mobile phones either, until you set up a page, created an account or built an app”. Once you drive traffic into a chatbot (assuming the experience is a good one), they will continue to use that channel. TS: So what’s next for We Build Bots? PS: Well, our flagship product is called IntelAgent and we’re just about to launch our Seedrs fundraise campaign alongside a number of private investment chats we’re having. We plan to close all of that by the new year and build the team to 30 over the next 24 months. With my other hat on, my other company Coup Media is organising OiConf in Bristol which is fast approaching, where we’ll be welcoming around 2500 delegates to Engine Shed and Passenger Shed in March. The event will be looking at the future of marketing, AI, and some core topics like inclusion, digital disruption and the digital skills gap. We’re also launching AI Conf as part of the event, which will be focusing on how businesses can take advantage of the latest AI and machine learning technologies. It will be our biggest show yet and we’re excited to make Bristol the home of what we hope will soon become a genuinely global event. You can grab your free ticket here: Register for OI Conference 2018. You may like: Want a chatbot to work out what food you want to eat and then get it delivered by a robot? Jamie Middleton is an editor and writer with a keen interest in technology and innovation. 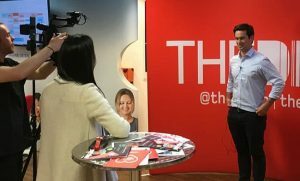 He was the founding editor of TechSPARK and was previously the Digital Communications Manager at the Technology Strategy Board - the UK government's innovation agency - and the Operations Editor for TechRadar.com - the UK's biggest technology review site.